The Elements and Principles of Design can be considered building blocks for composition. Elements are basic words to understand and then combine to achieve a Principle or make a story. 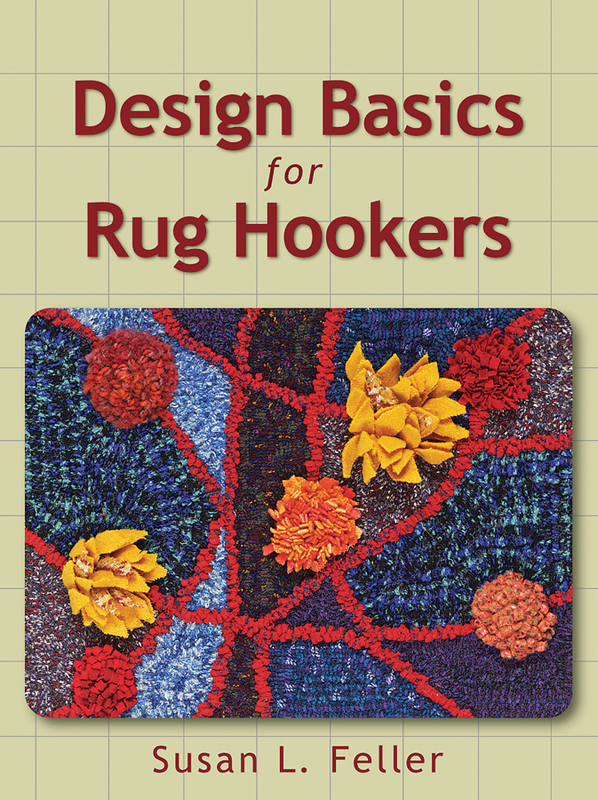 Elements and Principles of Design Excerpt: Design Basics for Rug Hookers by Susan L. Feller, Stackpole Books 2011 Click title to purchase. Line is a joining of points. Thickness, direction and length are variables.. Shapes are created by joining lines. They are 2-Dimensional: height and width. Form is any 3-Dimensional object. Form can be measured, from top to bottom (height), side to side (width), and from back to front (depth). Form is also defined by light and dark. A source of light on the object will convey form with the shadow or highlight associated by the exposure of light on the motif. Space is the area provided for a particular purpose. It may have two dimensions (length and width), such as a floor, or it may have three dimensions (length, width, and height). Space includes the background, fore and middle ground. Value refers to the relationship between light and dark on a surface or object and also helps create form. A value scale in fabric has 1 assigned to the lightest piece. Using a range of value in a work evokes a mood: middle values feel like a gray, rainy day; light values are cheery; and a dark work is somber. Color is a combination of light rays reflected from a surface. In order to see color a light source is necessary. Notice the lessening of discernable color when a light is dimmed and then turned off. Color has three characteristics: hue, value and intensity. Texture is the quality of a surface. In visual art, there are two types of texture: tactile and implied. In textile art there is texture in the materials used such as checks, plaids and tweeds. Contrast is a design principle which provides visual interest. This can be accomplished using changes in scale, color, value, shapes. Emphasis refers to areas of interest that guide the eye into and out of the image through the use of sequence, various levels of focal points, a change of value or intensity of color. Rhythm as a principle is used to organize a composition and create interest, unity or emphasis. Visual rhythm is achieved by the same effort- repeating a shape, color or line in a regular pattern. Movement can be achieved with a consistent directional line, or group of lines or by arranging shapes along an imaginary line. Pattern is defined as a single unit of design used in repetition. Balance – The eye perceives weights being equal and balanced when they have the same value, or intensity of color creating harmony. A design with equal shapes on either side of the imaginary dividing center line has symmetrical balance and is boring. Changing a motif or color on one side puts interest into the work. Unity refers to a sense that everything in a piece of work belongs there. It is achieved by the use of balance, repetition and/or design harmony. May I republish this post (with acknowledgment/link of course) on the blog of my hooking group, Hooked in London? Yes I appreciate your request and do approve reposting with link. Enjoy visiting the Hooked In London site myself. Looking forward to meeting up through our mutual interest and the organization The International Guild of Handhooking Rugmakers at TIGHR.net as the new board is based in the UK for three years.